Would YOU Expect To Get Shot For Jaywalking? Let’s get this out of the way right up front – we don’t condone fighting with the police, or the rioting and looting that has gone on in the wake of the death of unarmed teenager Michael Brown at the hands of a Ferguson, Missouri police officer. But, as reported by WFAA.com St. Louis, here are the facts of the incident leading to Michael Brown’s death according to the statement of Dorian Johnson, who was with Brown when the incident started and witnessed his death. Johnson said the incident started around 1:40 p.m. Saturday afternoon (August 9) when a police officer pulled up beside the pair as they were walking down the street near his grandmother's house. Johnson said the officer, whose name had not been released at the time he spoke to reporters, shoved open the car door, grabbed Brown around the neck and tried to pull him through the window. He said Brown never tried to reach for the officer's weapon. "The second time he says, 'I'll shoot,' a second later the gun went off and he let go," Johnson said. "That's how we were able to run at the same time." Johnson said he ducked behind a car as the officer continued shooting at them, first hitting Brown in the back and then in the head and chest after Brown turned toward the officer. Something is clearly wrong in our society if a police officer thinks it is necessary to tell a citizen to get out of the street and that citizen ends up dead for not complying with what might be a lawful, but certainly trivial police order. 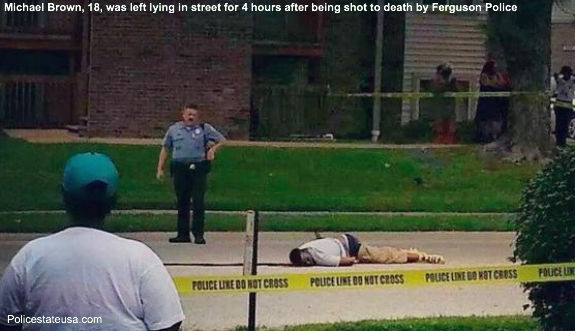 And by their actions since Brown’s death law enforcement officials in Ferguson have done little to clarify exactly what the police there think their job is. Far from calming the situation or bringing about order they have sent officers clad in military battle gear armed with automatic weapons to arrest journalists covering the unrest in the community, prompting Senator Ted Cruz to criticize the detention on Wednesday of reporters Wesley Lowery of The Washington Post and Ryan Reilly of The Huffington Post. The police response in Ferguson has been so heavy with military grade gear that the internet is awash in images comparing Ferguson to Iraq or Afghanistan. And Thompson says scenes from Ferguson have reached a point where Mashable has posted photos from Afghanistan, Iraq, and Ferguson—and asked readers to try to figure out where they’re from. Ted Cruz is absolutely right about the need for a free press in cases like this, but the elected official who really captured where we are coming from on the events in Ferguson is Senator Rand Paul. But says Paul, there is a “systemic problem” with today’s law enforcement. “When you couple this militarization of law enforcement with an erosion of civil liberties and due process that allows the police to become judge and jury—national security letters, no-knock searches, broad general warrants, pre-conviction forfeiture—we begin to have a very serious problem on our hands. Given these developments, it is almost impossible for many Americans not to feel like their government is targeting them. Given the racial disparities in our criminal justice system, it is impossible for African-Americans not to feel like their government is particularly targeting them,” concluded Senator Paul. Senator Paul is right and every comfortable upper income white person sitting around grousing about law and order knows in their heart it is true. Now it is time someone asked the next obvious question: If militarized, hyper-aggressive policing is such a great idea why isn’t it working in Ferguson, Missouri? Submitted by bcnavygw on Tue, 08/19/2014 - 17:38. Politicians and commentators who issue opinions on incidents such as Ferguson before all the facts are known are only using the incident to further whatever particular agenda they have, or are just as stupid as they appear to be. Submitted by exoticdoc2 on Tue, 08/19/2014 - 01:35. The senator is a moron...what else is new? The teen was not shot for jaywalking. He was shot because that is sometimes how trash that rob people and rough up store owners then fight with police end up.